Light and delicious smoked salmon mousse topped a layer of flaky roast smoked salmon and finished with a slice of classic smoked salmon. Simply turn out, slice and serve. This new sized terrine will do 4 for a starter. It's the ideal product to keep in the freezer as it cuts beautifully when well chilled. These fish pâtés are the all-time greats! Fish pâtés recipes include delicious starters, great light lunches, canapé ideas, snacks, dips - the list is endless. They freeze extremely well and are great served in combination. If you want to jazz up fish pâté canapés a little topping of trout or lumpfish caviar is brilliant. These plump, natural, undyed kippers are quite simply the best - how kippers used to be, succulent, tasty, a meal on their own. I always grill them with a knob of butter. Approx 400g per/pair. Here are a variety of selections your sure to enjoy. 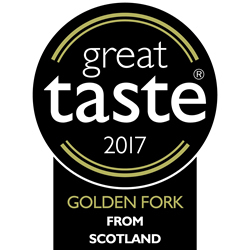 The BEST sauce for Inverawe's smoked fish. It has a piquante that lifts every mouthful into the extraordinary.